Chado or Sado (referred to as tea ceremony) is a traditional ritual influenced by Zen Buddhism. Powdered green tea (matcha) is ceremonially prepared by adding hot water and mixing it with a bamboo whisk. Then it is served to a small group of guests one by one in a Japanese tea room. *NOT included in the congress registration. 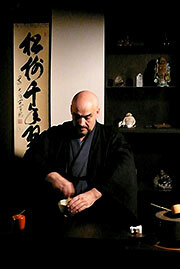 Randy Channell came to Japan in the early 80’s to study Budo (martial arts). He began his studies in Chanoyu (the way of tea) shortly thereafter to balance his martial training, but as time went on tea came to take over as the main focus of his studies. In 1993 he was granted permission and received a scholarship from the previous Oiemoto of the Urasenke tradition, Dr. Sen Genshitsu to study at the Urasenke Gakuen Professional College of Chado, which he attended for three years. While there he attended innumerable tea related events and functions. He later received his Kyoju (professorship) from the current Oiemoto, Sen Soshitsu XVI, Zabosai. Soei Sensei has been involved in hundreds of tea gatherings, conferences, demonstrations, presentations, lectures and galleries. He is often featured in newspaper and magazine articles and also makes frequent radio & TV appearances. He presently teaches at Doshisha University in Kyoto and holds lessons in the way of tea at Nashinoki shrine just east of the Imperial Palace and in Omotesando in Tokyo. He is the owner of ran Hotei, a small Japanese café /gallery near the Nijo Castle. 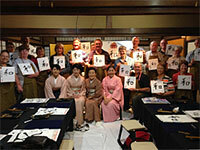 He has been appointed by the mayor as an Ambassador of Hospitality for Kyoto City. Shodo, or calligraphy, is the art of writing Chinese characters (known as kanji) as well as the two Japanese syllabaries (known as kana) using brushes, ink, and paper. Nowadays people do not use Shodo for practical purposes, but it remains an important part of Japanese culture. Origami, one of the Japan's unique arts, is now famous throughout the world. Square pieces of paper are folded into various shapes such as birds, animals or flowers. Tickets for the Japanese Cultural Program can be purchased through the Online Registration Form and the payment should be completed before September 18. Please note that once you order and pay for the tickets, no refund will be made.